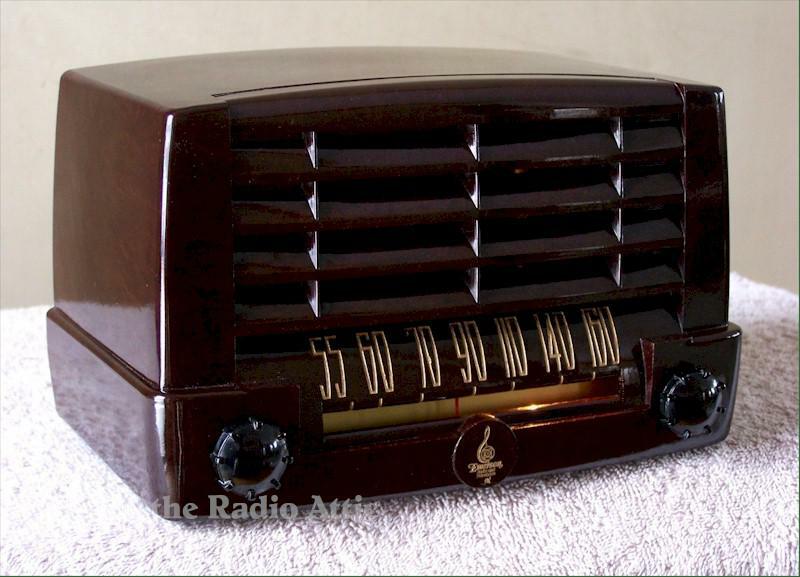 From '47 comes an early itty-bitty-teeny-weenie chocolate brown (bikini) I mean, Bakelite Emerson. No, it ain't a midget, but not too much larger than the one Emerson introduced the same year! They both share the same five tube complement under the hood. It plays real good and has an external antenna for extra station sensitivity! It's just as shiny as the dickens! It has been electronically reconditioned, aligned with all paper and electrolytic capacitors replaced along with quite a few outta whack resistors. The five tubes are good! A Jim Dennis "Scale of Beauty" Beach Party Bingo Special! If you'd like additional pictures please let me know. 8-1/2"W x 5-1/2"H x 5-1/4"D.